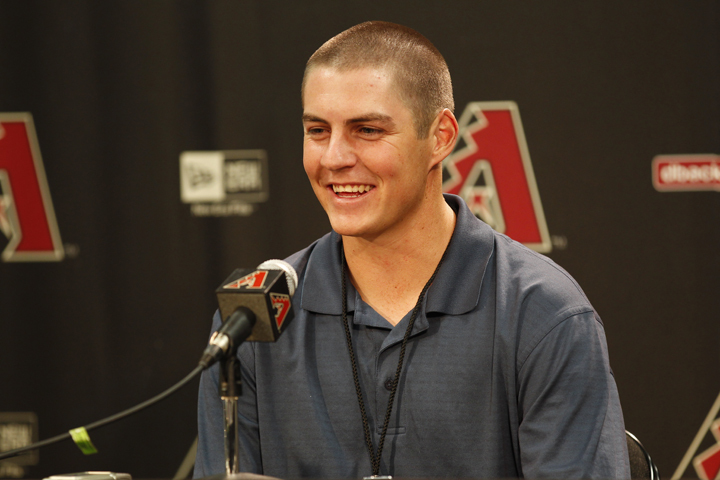 In last week’s 2011 MLB First-Year Player Draft, the D-backs made a splash with the selection of highly touted UCLA pitcher Trevor Bauer. The third overall pick got his first taste of life as a D-back on Tuesday, when he received the full Chase Field experience and attended the series-opening game against the rival Giants. Bauer was escorted on a tour of the ballpark and met D-backs skipper Kirk Gibson and the coaching staff, as well as several of the team’s current players. Bauer wasn’t alone during his D-backs journey. His father, Warren, was also in attendance throughout Tuesday’s events, while the entire Bauer clan made the trip to Phoenix this week. The 6-foot-2 Bauer is fresh off a dominating season as a member of the UCLA baseball team. In 16 starts, he posted a 13-2 record with a miniscule 1.25 ERA. Bauer’s 203 strikeouts led the entire NCAA. Of his 16 starts, 10 of them were complete games. The right-hander’s success did not go unnoticed as he received plenty of national recognition. He claimed National Player of the Year honors from Louisville Slugger/Collegiate Baseball. Bauer was also awarded as the Pac-10 Pitcher of the Year, and was a top-three semifinalist for the Golden Spikes Award. This week’s visit to the Valley of Sun wasn’t Bauer’s first trip to Arizona. Just three weeks ago, Bauer and his Bruins came to Tempe for a three-game series against Arizona State. Bauer dominated in his May 28th start, unleashing a complete-game shutout over the Sun Devils. Of course, all those accolades and performances came as a collegiate player. Bauer now faces the tall task of translating his talent to the professional level. Bauer’s professional debut has yet to be determined. 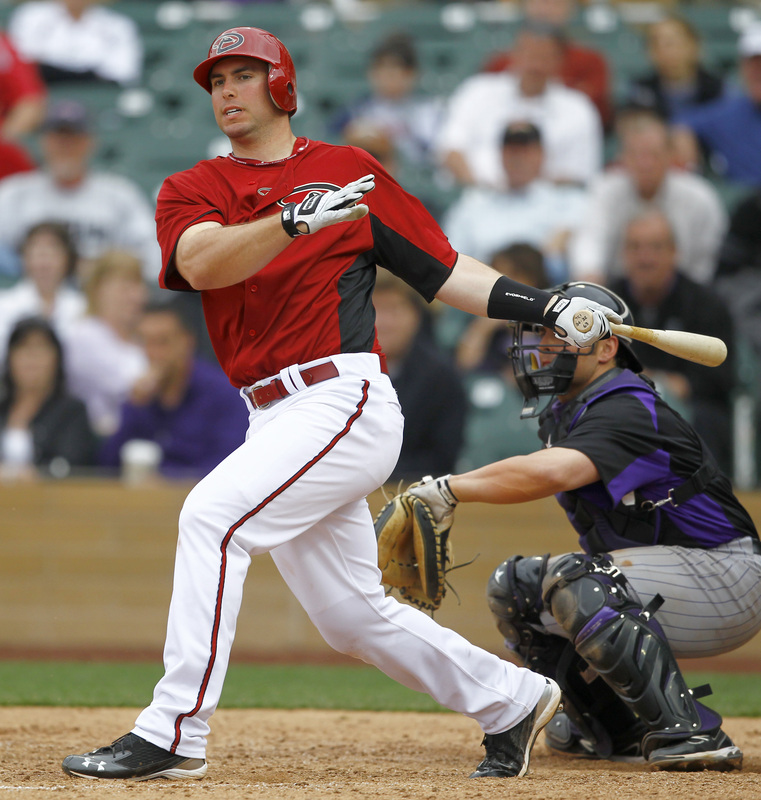 He has not signed with the D-backs, and is unsure of when those negotiations will be hammered out. All that matters to him is that it’s sometime in the near future. Whenever Bauer does sign, he will embark on what he hopes to be a rapid ascension through the minor league ranks. Despite being just 20 years old, Bauer hopes to be on the Chase Field mound in the near future. Whether or not Bauer reaches the Major Leagues next season remains to be seen. However, the talented right-hander holds high expectations for his future. 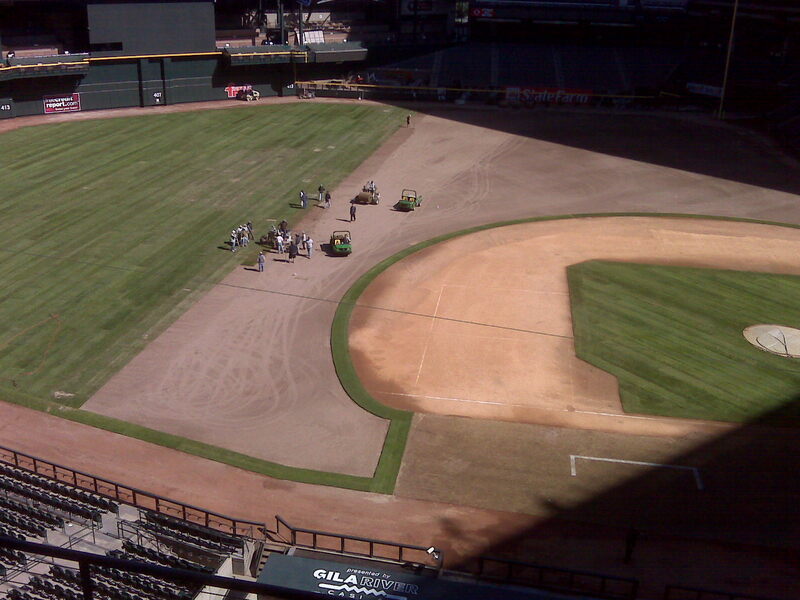 One more sign that baseball season is coming: the turf is being put in at Chase Field today. 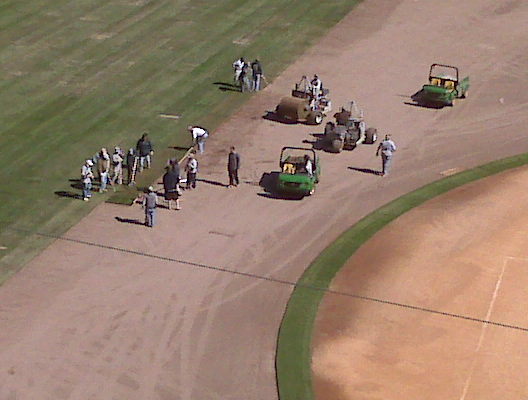 This will give the sod and grass just over four weeks to set in before the D-backs play their first game on the field against the Chicago Cubs for the final two exhibition games on April 2 and 3 (those tickets go on sale Saturday, more on that below). 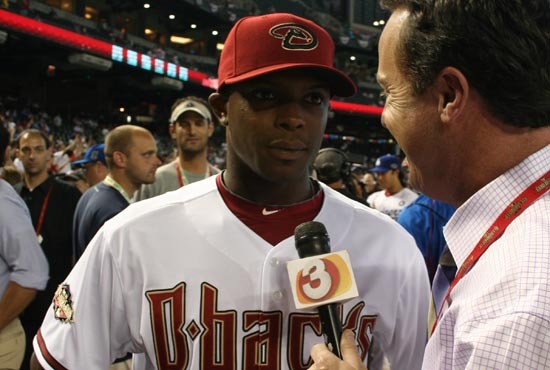 As of the time of this blog post, we are just 33 days away (793 1/2 hours if you want to break it down further) from the first pitch of the regular season against the Padres at Chase Field. The D-backs will begin offering tickets to all 81 regular season games — including Opening Day — plus the two aforementioned games against the Cubs at 9 a.m. on Saturday, March 6. In addition to purchasing tickets at Chase Field, you can call 602.514.8400 or 1.800.777.4664 if you’re outside the Phoenix area. 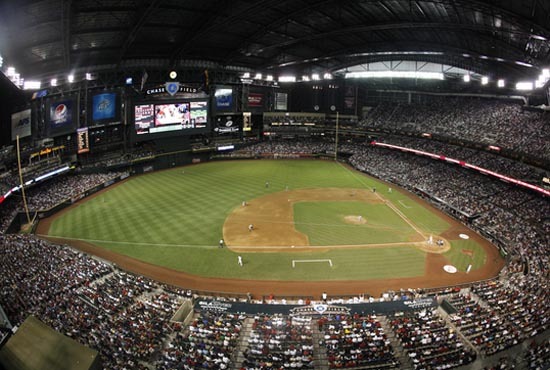 Additionally, you can visit dbacks.com or go to any one of the 36 Ticketmaster Retail Outlets in Arizona, including 28 Fry’s Food Stores or Fry’s Marketplace locations. The majority of tickets will range from $8-60 and schedule highlights include Opening Day, a weekend series against the National League champion Philadelphia Phillies April 23-25, a three-game interleague series against the World Series champion New York Yankees June 21-23, a Fourth of July weekend series against the Dodgers July 2-4 and a three-game set with the Cubs July 5-7. If you want to lock in your seats before tickets go on sale Saturday, fans can buy various packages including the 6-Pack or 10-Pack Plus. The 10-Pack Plus includes tickets to any combination of 10 games, $10 in D-backs to purchase merchandise at Team Shop locations or food at any concession stand inside Chase Field, and a $5 gift card from Circle-K. Fans interested in purchasing mini-plans can go to dbacks.com/6pack or dbacks.com/10pack.